To find an automated solution capable of increasing productivity at a cake factory. By improving throughput, the new system would reduce the need for nightshifts and the monotonous manual work that decorating huge numbers of cakes involves. Needless to say, quality and craftsmanship had to remain as high as ever. Use robots to help produce and finish Suteria’s popular Swiss Solothurner Torte cakes. Since Fanuc LR Mate compact robots were already part of the solution proposed for the bakery, LR Mates were also enlisted to decorate the Torte as well as other cakes. The FANUC LR Mate robot has proven to be ideally suited to completing these intricate yet, for humans, extremely monotonous tasks. With the approximate reach and dexterity of a human arm, the LR Mate has become a real asset to the bakery. It's sweet, it's famous, and it looks sensational. It is also delicious, Suteria's Solothurner Torte. In the bakery, a FANUC robot assists in production. Actually, using robots to make cakes is not a novel idea at all. The idea to auto-mate cake decoration is even older. Because some 30 years ago, prior to holi-days, when company owner Manfred Suter often had to work for nights on end in the bakery, jousting with the pastry bag, he had a flash of inspiration to find a solu-tion. And over the years he tried out various mechanical approaches to automa-tion. Initial attempts to emulate the mechanism of a phonograph remained in their infancy. The toil continued, and wages continued to increase. At a jazz concert, Suter then met the engineer Ernst Ramseyer, who had devel-oped a machine for applying salt to the round cheese loaves in the production of "Tete de moine" cheese. Suter took up the topic and adapted his own solution – thanks to Adrian Albiez, automation specialist and owner at the time of Altron Sys-tems AG, Neuhausen am Rheinfall. A FANUC robot was already part of the initial proposed solution for use in the bakery; it successfully completed the task, and from that point on, it was enlisted to decorate the Japonais filling – like the Solothurner Torte, but with a ground hazelnut mixture. The "Original Solothurner Torte" is produced according to a recipe which in the year 2015 will be one hundred years old. The torte is a best-selling product at Suteria Chocolata AG, in the Swiss town of Solothurn. The second main product is "Champagne Truffles". For both traditional specialities, the company garnered two gold medals at the 2010 Swiss Bakery Trophy in competition with 1,400 other products. An LR Mate robot from FANUC contributed to the success. The role that the robot plays in finishing the cake is modest, yet the rationale for its use is truly a "classic" scenario. It completes a monotone and, what's more, extremely tedious tasks. There were no preconceived ideas about the deployment. However, as Michael Brüderli pointed out: "Our business had grown to such a volume that we had to be mindful of our resources." The CEO is a trained pastry chef and chocolatier in his own right, and after his apprenticeship at Suteria, he gained several years of ex-perience and gained further training in various departments working for a large chocolate manufacturer. He has been back in Solothurn for three years now. Traditional crafts are well renowned at Suteria. Throughout the entire region, a leaving certificate for a successful apprenticeship is considered a ticket into the world of chocolates, pastries and pralines. Nonetheless, it's understandable why many work steps are automated or at least mechanised. There is a "filling ma-chine" for the filling of the truffles, and batters are mixed in a machine. All this takes place within a limited scope and without any pressure. Whilst robots are ex-pressly deployed in other industries for reasons of quality, Michael Brüderli re-marks: "Where the robot has no influence on quality, but can relieve and assist us in the work flow, we are delighted to put it to use." It was high time to deploy robots, as Manfred Suter recalls: "We lost people who were required to do this work." No wonder the pastry chefs at Suteria appreciate their new colleague. Suter: "If you can combine the traditional craftsmanship with the use of the robot, yet still remain unique with your product, then there are com-pelling reasons to automate." He said the right combination was also an important factor for preserving the product and the location. Considering the thousands of cakes per year, the LR Mate became a highly-regarded asset in the bakery. With a reach of approx. 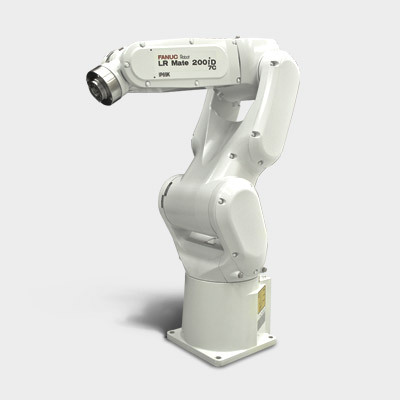 700 mm and a payload of 5 kg, "he" is the technical epitome of a human arm and also an ideal helper in food production. Like all pastry chefs, he wears a white protective apron. He is not re-quired to wear a cap, however. The operation of the cell is streamlined to just a few routines. The dispensing unit, container and hoses are naturally designed for optimal cleaning properties, even though the same product is always produced and there is no danger of "contamination" of other recipes. "Incidentally, the injec-tion nozzle is the same one we use for manual operation", remarks Brüderli. On a small touchscreen, the operator specifies one out of six cake sizes between 12 and 26 cm in diameter. The employee fills the dispensing unit with the hazel-nut- meringue mixture, provides for a stack of baking trays, and he is ready to press the start button. Depending upon the cake size selected, eight or twelve me-ringue covers fit on a baking tray. Each cake has a base and a meringue cover. Using the dispensing unit, the robot distributes the mixture in circular movements. Occasionally, a few manual corrections are required, because the meringue mix-ture is not allowed to be processed under high pressure, and air enclosures can lead to flaws. Once the baking tray is full, the employee removes it from the cell, and it goes into the oven, where it is baked always at the same low temperature. An empty tray is then pulled from a stack into the robot cell. "Uncompromising quality" is Suteria's motto. Michael Brüderli explains what that means in real terms: "It takes good ingredients to make a good product." Brüderli says there's nothing wrong with purchasing more economically. His "Swiss Made" strategy goes in the other direction, however: "It's important for us to always have consistently high quality." Suteria's customers expect no less. This also includes the freshness of all their products. That's why the robot gets by working half-day shifts. The FANUC doesn't reach the limits of its performance. It's not supposed to either. Sales determine the produced quantity. Only before major holidays does the robot occasionally put in an extra shift. And nonetheless: "We earned our reputation through a traditional craft." That will always stay the same. "Also in the future, we will be exclusively producing a 'Swiss Made' product", says the designated Managing Director. He does indeed have ideas for expansion. He says China is a potential project. But it would exclu-sively involve sales outlets and only the chocolate business. In the future, the "Original Solothurner Torte" will still continue to originate exclusively from Solo-thurn. Michael Brüderli: "We produce as much as we can manually produce. That's enough."